Rising levels of CO2 in the atmosphere have led to increased CO2 concentrations in the oceans. This enhanced carbon availability to the marine primary producers has the potential to change their nutrient stoichiometry, and higher carbon-to-nutrient ratios are expected. As a result, the quality of the primary producers as food for herbivores may change. Here, we present experimental work showing the effect of feeding Rhodomonas salina grown under different pCO2 (200, 400 and 800 μatm) on the copepod Acartia tonsa. The rate of development of copepodites decreased with increasing CO2 availability to the algae. 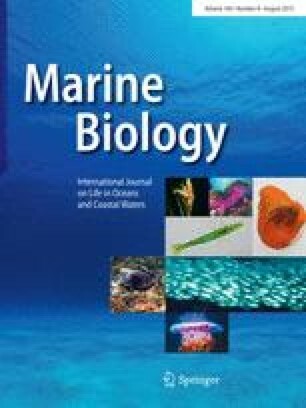 The surplus carbon in the algae was excreted by the copepods, with younger stages (copepodites) excreting most of their surplus carbon through respiration and adult copepods excreting surplus carbon mostly as DOC. We consider the possible consequences of different excretory pathways for the ecosystem. A continued increase in the CO2 availability for primary production, together with changes in the nutrient loading of coastal ecosystems, may cause changes in the trophic links between primary producers and herbivores. We would like to thank the German Federal Ministry of Education and Research (BMBF) for funding. This study was part of the BIOACID Project and we are grateful for the support and feedback from our colleagues, particularly Stefanie Schnell. Special thanks are due to Bettina Oppermann and Julia Haafke for technical support. We thank Sam Dupont and two Reviewers, whose comments greatly improved the manuscript.